My Fisher-Price Favourites! 20% off Toys R Us Promo Code! My VINE Clip of the Vintage Fisher-Price Medieval Castle! There have always been Fisher-Price toys in our household, from as long as I can remember. As a child in the early 1970s, I remember being a toddler playing with the Fisher-Price "popcorn popper" (it's a circular dome on a long handle, filled with small colorful balls that "pop" when you push or pull the toy). They still make it to this day. I also fondly remember playing with the Fisher-Price schoolbus with wooden "Little People", that I would pull around on a string. The people would go up and down as the bus wheels turned. Fisher-Price still makes a similar toy today. My older brother fondly remembers hours and hours of play with the Fisher-Price parking garage and Fisher-Price medieval castle. Would you guess? They still make this toy today! Check out my 6-second VINE video, above, of our vintage Fisher-Price medieval castle! And fitting this pattern, I remember playing with the Fisher-Price farmhouse. Not only do they still make it today, but I even bought one for my baby daughter. Here's a photo of her playing with it, below. Although the current model is called the Fisher-Price Little People Animal Sounds Farm, it is the very same concept as the farm that I played with in the 1970s--and the one my daughter played with in 2006! 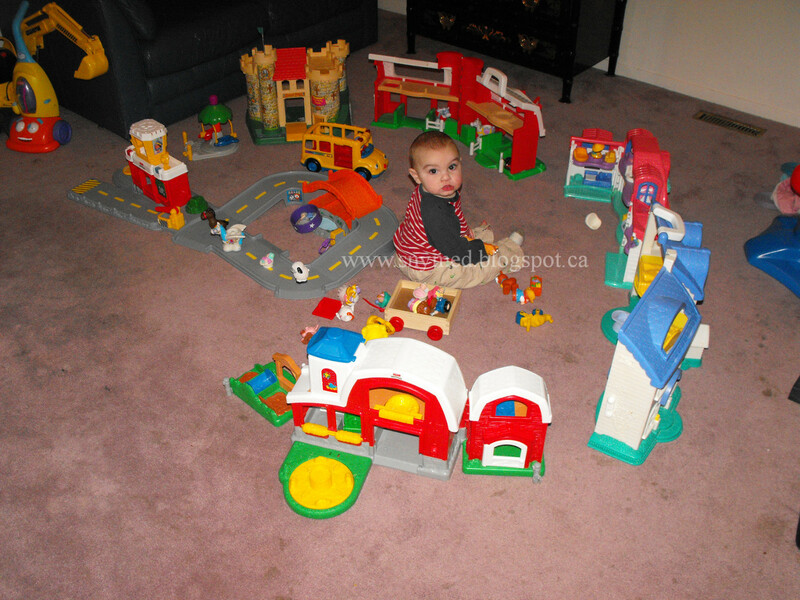 I just found a photo of my oldest two kids playing with an entire Fisher-Price "village" in 2008, below. 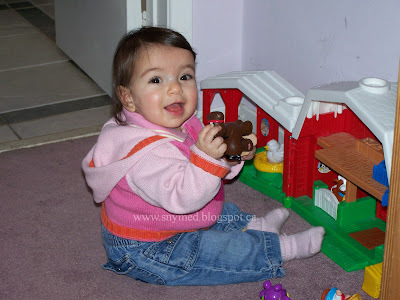 And also see below, a photo of my 4th child playing with a Fisher-Price farmhouse in 2009! Why does this toy endure, as well as countless other Fisher-Price toys? Fisher-Price toys endure because they offer universal appeal to infants, babies and toddlers wherever their products are sold. Some of this universal appeal includes friendly animals and people that fit into a child's hand; playsets scaled in proportion to a child; bright, happy colours to draw a child in; play that provides fun and learning in one--and that helps children reach developmental milestones, and toys that always provide a surprise. A surprise can be a delightful sound, a happy sight peek-a-booed, or something soft to the touch. On a similar note, when my first child was born in 2005, I wanted him to have a beautiful mobile for his beautiful nursery. I looked everywhere for the perfect one--and found the Fisher-Price Ocean Wonders Aquarium. I loved the colorful, plush fish with friendly faces that would float above my baby boy. I liked the "fishbowl" that was squishy to the touch. And I loved that in the dark, the mobile had lights that would be projected onto the nursery ceiling. It looked like fish were swimming overhead. There was only one problem: my son would cry whenever the mobile shut off. However, the mobile had a remote control so I could turn it on without entering the nursery and disturbing my son. Stealth operation successful! 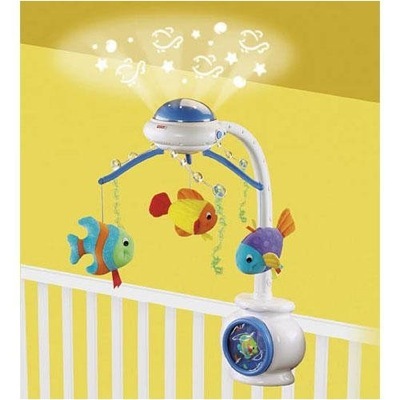 My Son's Fisher Price Ocean Wonders Mobile! 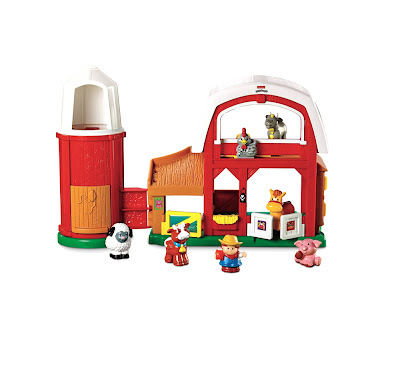 Would you like 20% off any of these awesome Fisher-Price Favourites? Use Discount Code: FISHERPRICE20 to receive 20% off Fisher-Price Favourites at Toys R Us! This promo code is good from March 29th to April 30th, 2013. Make sure to use the special code at checkout! What is your Fisher-Price "Favourite"? Do you have any modern or vintage Fisher-Price stories to share? We had SO many Fisher Price toys in our house with our kids when they were babies, and still have a few now that they're a few years older. They really do endure the test of time, and actually, all of our Fisher Price toys look like brand new still, even though they've been played with constantly. I loved our Fisher Price Rainforest Swing, Fisher Price Infant-Toddler chair, and the many Little People sets we have. I grew up with them as well and it's awesome that they grow with you and your family :) Your daughter is ADORABLE in that picture! Thanks Brandi! If I were to make a full list of Fisher-Price toys that we own, have owned, or I had as a child, I'm guessing that the list would be over 50 items, no joke! I had a LOT of FP toys growing up. One of my favourites was a two story car garage at my Church nursery. I LOVED that thing! 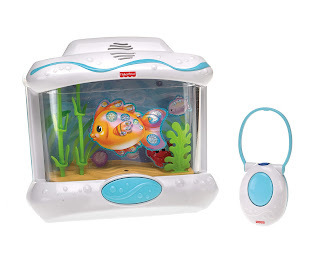 I do have the Ocean Wonders Aquarium for my daughter and she LOVES it. My only issue with it is that the batteries doesn't last very long at all since she knows how to turn it on for herself! Elizabeth, as my kids are close-in-age, I always had two kids in (different) cribs at the same time. For the second crib I had a Fisher-Price Flutterbye mobile. It was amazing. To skirt the battery issue, we bought 2 sets of rechargeables. 3 cheers for Lego! My son got a great Playmobile pirate set at his birthday party yesterday! We have had many Fisher-Price favorites in our house too! The barn is always popular and it is great for many ages of children that come over to play! I still remember the vintage Fisher Price farmhouse that had the metal silo filled with animals. I run into it regularly at yard sales--still in perfect condition! My kids still play with their Fisher Price Farmhouse. We recently found an old schoolhouse and camper with all the accessories of my brothers. 35 years later and they're still amusing kids (now mine). Thanks for the trip down memory lane. Sarah, good times! I bought a vintage Fisher Price record player (with records) at a yard sale. After 40 years it still worked at worked well. So delightful. My son has the farm too and loves it! I loved each of the sets when I was a kid. We had the farmhouse too. Fisher price toys were the first toys I raced out to buy for my kids. They are truly timeless. We still have several sets I will never part with - little people was even the name of my daycare when my babes were little and I was at home. We had tons if fisher price toys. Paula, I see you love the toys too! As I started to write this post and looked back on photos of my kids at play, there were so many FP toys: the Laugh and Learn House, Phone, Chair, several highchairs and bouncy chairs, toy keys, playsets, mobile and lots more. I think it's neat that your daycare was called "Little People", Paula! Koala Kid on DVD Today! Our Visit to Shoppers Drug Mart! My 100-Day Fitness Update & Zaggora Review! Great Wolf Lodge Niagara Falls Review! Disney's AWESOME Summer Movie Line Up! Jurassic Park 3D in Theaters April 5th!